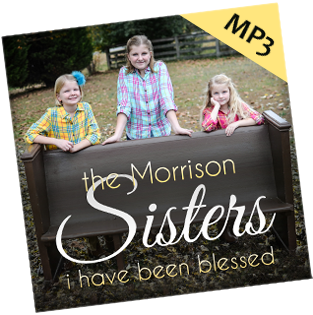 Welcome to the internet home of the singing Morrison Sisters from Calhoun, GA! We sincerely hope you’ll take a look around, check out our schedule, watch some videos, listen to some music, and let us know if you have any questions or comments! Oh, and follow us on Facebook, Twitter, YouTube, and Instagram if you like! God bless you all! Happy New Year from the Morrison Sisters! Wishing all of you a happy and blessed new year! Less than two weeks away! 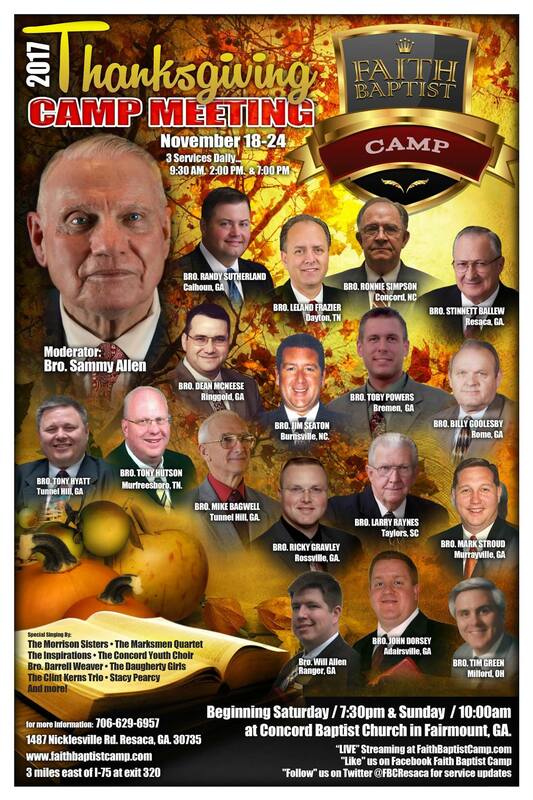 We’d like to invite everyone to join us November 18-24, 2017 for our home church’s annual Thanksgiving Campmeeting at Faith Baptist Camp in Resaca, GA! This year’s lineup includes some of the finest preachers and singers in the country! Pastor Ricky Gravley – Bible Baptist Church, Rossville, GA.
Pastor Leland Frazier – Victory Baptist Church, Dayton, TN. Pastor Ronnie Simpson – Bright Light Baptist Church, Concord, NC. We have three campmeetings each year (June, August and November) at our home church and this one is our personal favorite! 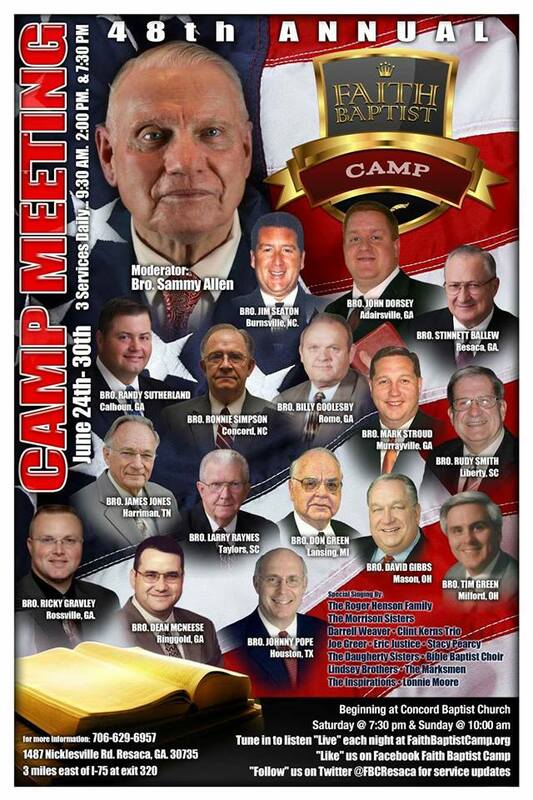 Folks, if you’ve never been to camp meeting you simply don’t know what you’re missing. There’s truly no experience like it on planet earth. A full week of preaching, singing, shouting, fun, food, and fellowship. The November meeting is an extra special treat! Services 3 times daily (morning, afternoon, evening). Three home cooked meals served each day, free of charge (also, full salad and snack bar available daily and $2.00 hamburger and hot dog plates after the evening services). Special home cooked Thanksgiving spread on Thanksgiving day! Turkey, dressing, and all the fixings! Stay the entire week in our men’s and women’s dorms for $3.00 (yes, you read right, 3 dollars). 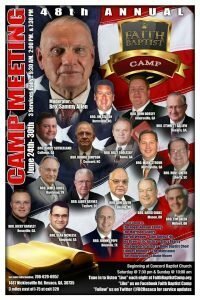 We’d like to invite everyone to join us June 25-30, 2017 for our home church’s 48th annual June camp meeting at Faith Baptist Camp in Resaca, GA! If you’ve never been to camp meeting you simply don’t know what you’re missing. There’s truly no experience like it on planet earth. A full week of preaching, singing, shouting, fun, food, and fellowship. Three meals served each day, free of charge (also, full salad and snack bar available daily and $2.00 hamburger and hot dog plates after the evening services). Stay the entire week in our men’s and women’s dorms for $3.00 (no, that’s not a typo, it really is just $3 bucks). This year’s preaching and singing lineup promises to be one of the best ever so you don’t want to miss it! We’d love to have you join us! 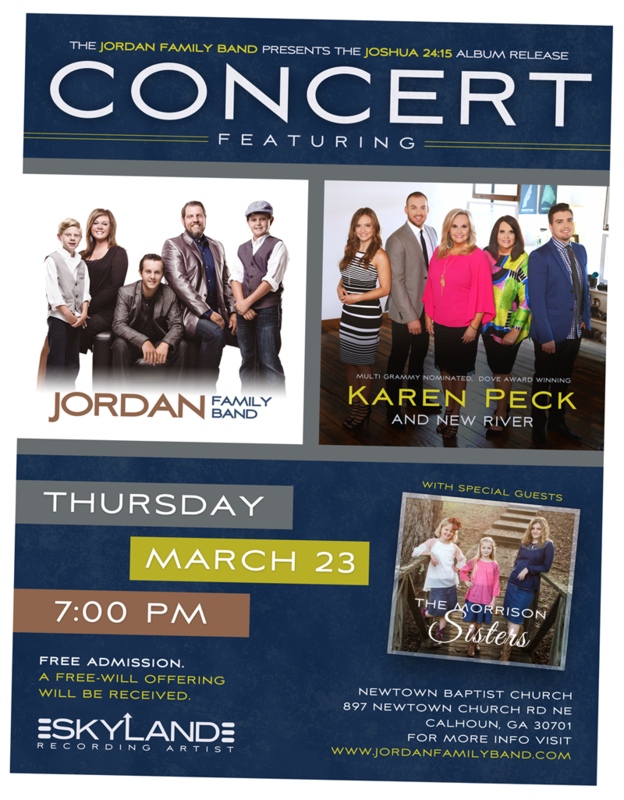 We are SUPER excited to be part of the Jordan Family Band’s upcoming Joshua 24:15 album release concert! 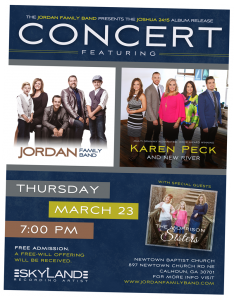 The concert will featuring the Jordan Family Band and Karen Peck & New River with special guests – yours truly – the Morrison Sisters! This is going to be a truly special night and we hope all of you can come be a part of it! Mark your calendars for March 23rd at 7pm at the beautiful New Town Baptist Church in Calhoun, GA! Oh, and did we mention admission is FREE? So there’s no excuse to not come – lol! There’s limited seating available so be sure to arrive early! 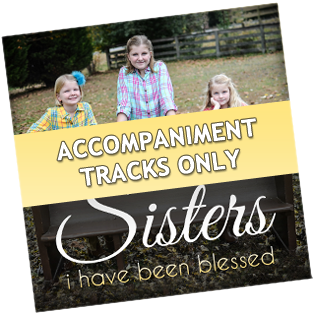 For more information visit www.jordanfamilyband.com or call (678)767-3510. 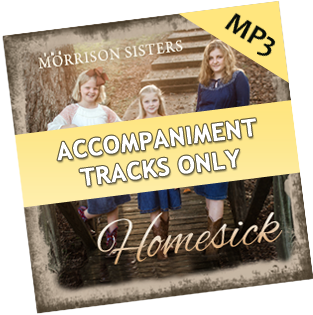 “Homesick” Now Available on CD! 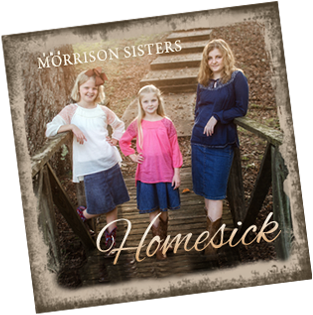 Our new album “Homesick” is now available on CD and can be purchase by clicking here! This project was such a labor of love and we truly hope God’s hand will be upon it and that it will bless you all! “Thank you” to all who made it possible. 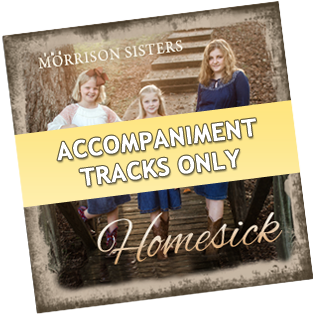 Our new album “Homesick” is finally finished! 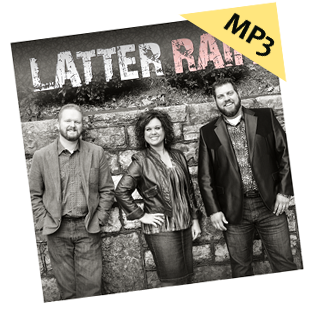 For a limited time you can purchase and download the entire album from our website for the special sale price of $10.00! 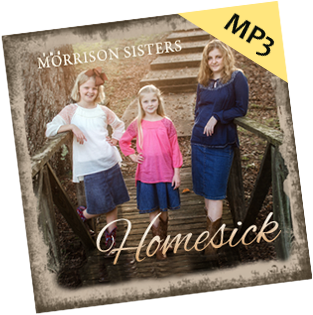 And for those of you who don’t have a digital media player, be sure to check back later as we will soon have it available on the website in CD format as well. As many of you know, this project has been a long time coming and it seemed many times it was never going to happen. But God’s timing is the best timing and we are so thankful He has finally allowed us to complete it! We want to say a special “Thank you” to all who made this project possible. It was truly a labor of love and we sincerely hope it will bless and encourage each and every one of you! Several weeks ago Bro. Joe Anders (a dear friend of ours who was a member of our church years ago) shared with us a new song he had written. 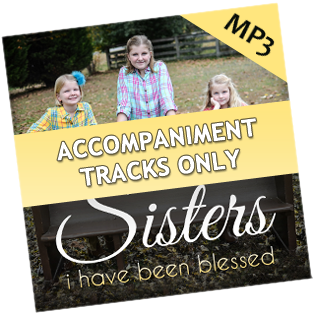 It has such a wonderful message and melody and we are thrilled that Bro. Joe sent us the words so we could learn it. This was the only the second time we had did it live so it’s a bit rough but we wanted to share it anyway. We love it! 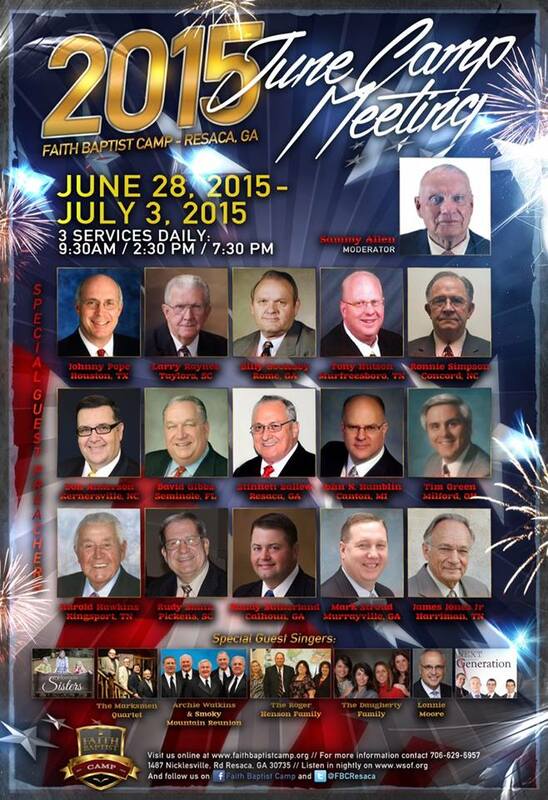 The June camp meeting at Faith Baptist Camp in Resaca, GA is fast approaching and you simply don’t want to miss it as this year promises to be one of the best yet! 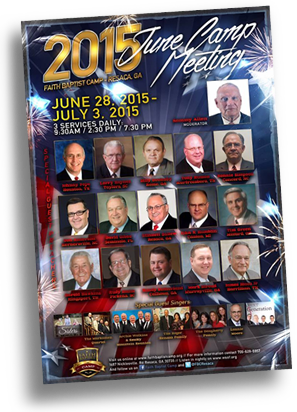 There will be a phenomenal lineup of preachers attending this years meeting including David Gibbs, Johnny Pope, Tim Green, Larry Raynes, Mark Stroud, Billy Goolesby, James Jones Jr. and John Hamblin. 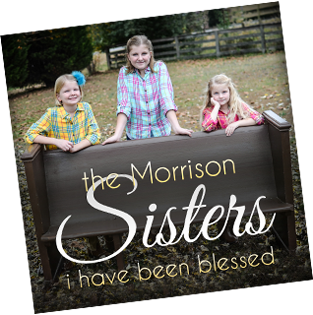 In addition to The Morrison Sisters, special music will be provided by Archie Watkins & Smoky Mountain Reunion, The Marksmen Quartet, and many others. The dates for this year’s meeting are June 28 – July 3. As always, there will be 3 services daily (9:30am, 2:30pm, and 7:30pm), 3 hot meals served before each, and you can stay all week in the air conditioned dorms for only $3.00. Yes, you read that right. $3.00. Did we mention they have the best salad bar, hamburgers, and hotdogs in the United States too? It is our earnest prayer that God will do great things in this meeting and we sincerely hope that you all can attend. If you can’t, please pray that God’s will will be done in every service and that He will move in a mighty way. And would you also join us in praying especially for Pastor Allen, Assistant Pastor Randy Sutherland, and Bro. Stinnett Ballew as they moderate and administrate the meeting? We know they would greatly appreciate it! 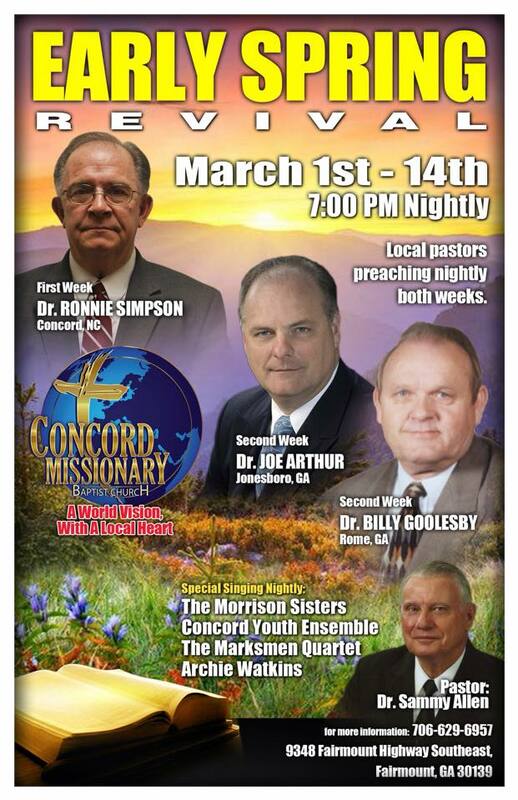 We’re currently in Revival at our home church, Concord Baptist, in Fairmount, GA. We want to extend each and every one of you a cordial invitation to come and be with us during these next two weeks. Services start at 7:00 P.M. nightly. We promise you will be glad you came. We’ve already had one precious soul saved this week and we are looking for God to do much, much more. We firmly believe we are living in the last days but also believe that God still wants to do “great and mighty things” in the days before His return. Meetings like this can be the start of something great and we want you to be a part of it! 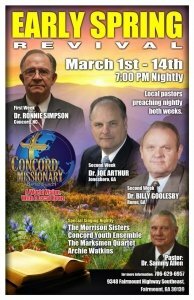 We have some of the best preachers in the country preaching each evening in Bro. Billy Goolesby, Bro. Joe Arthur, and Bro. Ronny Simpson. On the evenings of March 8-9 Archie Watkins of the Inspirations will be singing. Oh, and did we mention the Concord Youth Ensemble and the Morrison Sisters are singing throughout the week as well? You don’t want to miss a night! Come and be blessed! Meet our dear friends, Bro. Chris & Sis. Chloe Hewett. Bro. Chris Hewett is in full time ministry and relies completely on God’s people for his monthly income. Mrs. Chloe is 26 weeks expecting with twin girls and one of the babies has passed away causing some complications that has brought them off the road indefinitely. A GoFundMe campaign has been created for them and we’d like to ask any who can to join with us in helping this sweet couple to do so. Any gift will help take an immense amount of pressure off this family as they rest and wait for God to move. You can also follow the Hewetts on their Facebook page.